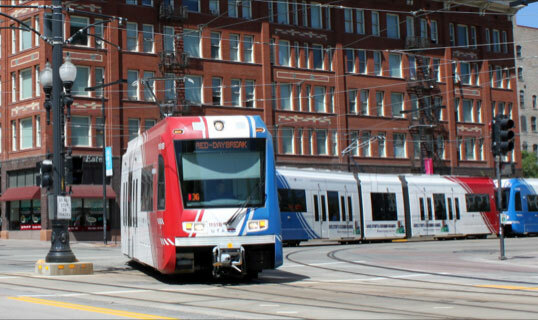 Since 1999, Salt Lake City, Utah, has added 140 miles of light rail and commuter rail — each line completed early and under budget. That tremendous civic accomplishment has made the city a somewhat unlikely transit expansion success story. Prior to the construction of Salt Lake City’s first rail line, transit planners purchased strategic portions of rail right-of-way. They did this even before settling on a route or establishing a funding method. UTA also acted early to get the train cars and other materials they needed to deliver the project. That helped UTA acquire essential project elements at low prices and avoid delays, Lewis found. When UTA took on its FrontLines 2015 project to deliver 70 miles of rail, the agency chose to construct five rail segments simultaneously. Rather than structure these routes as independent projects, UTA bundled them together. This strategy helped reduce the risk of costly delays. Sure enough, during the course of construction, UTA workers unearthed the remains of a Native American village. It took nine months to preserve the artifacts and get the project moving again. But because there were other projects happening simultaneously, it didn’t result in a tremendous waste of resources. Planners were able to “concentrate on another section and later return to the delayed portion,” according to Lewis. UTA was creative in structuring contracts with independent construction firms. The contracts are designed to reduce cost by providing incentives — to both the contractor and the transit agency — to avoid expensive delays. Lewis found that “these performance-contracting measures played a crucial role in expediting the project delivery and reducing overall costs.” Sections of the FrontRunner commuter rail system, for instance, cost between $13 million per mile and $20 million per mile to build, below the national average, according to the report. Since the first line was completed, UTA’s stellar performance record helped win public support for continuing rail expansion, said UTA General Manager Mike Allegra. #2 is particularly important. Having a diverse set of projects ongoing allows smart resource diversion when inevitable specific delays and setbacks do occur. It also produces economies of scale and vastly reduce per-mile overhead and supervision costs. An aspect not tackled was the fact UTA established guidelines for all lines, and all municipalities concerned agreed, beforehand, they’d have to pay up with their own money for additional improvements, preventing the whole issue of last-minute holdouts. It’s embarrassing that Salt Lake City gets this much new light rail, and NYC just gets underperforming buses.